Considered one of the great aircraft of all time with a kill ratio of 10:1. Plastic model kit of the Fiat CR.32, an Italian biplane fighter used in the Spanish Civil War and World War II, compact, robust and supremely manoeuvrable, the plane gave impressive displays all over Europe in the hands of the Italian Pattuglie Acrobatiche. 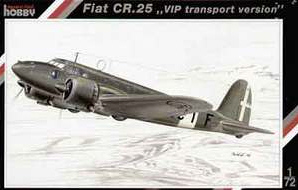 The CR.32 used in combat in North and East Africa, in Albania and in the Mediterranean theatre, it saw service in the air forces of China, Austria, Hungary, Paraguay and Venezuela. 1-48 scale. IMAM Romeo Ro.44. Special Hobby. 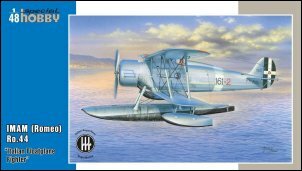 The IMAM Ro.44 was a fighter seaplane developed in Italy, a single seater derivative of the Ro.43 that first flew in October 1936. 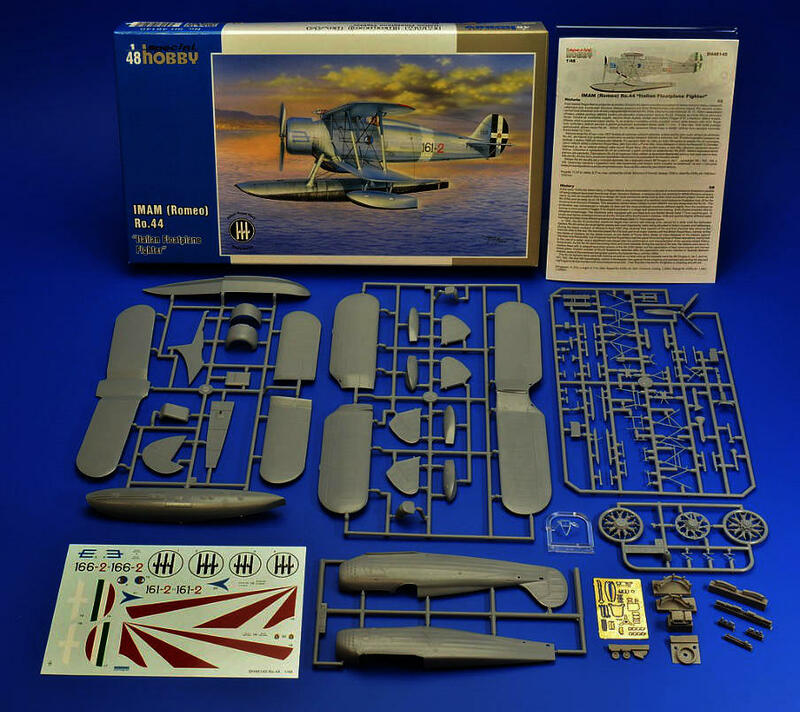 Kit features engraved panel lines, restrained fabric-over-frame effects, well appointed cockpit, machine guns, engine detail, two-piece cowling, one-piece three-blade propeller, injection-molded windscreen, extensive resin and photoetch parts, float undercarriage with beaching gear. 1/48 scale. 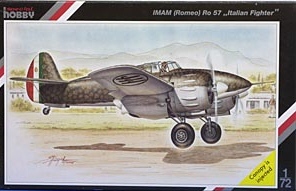 IMAM Romeo Ro.43. Special Hobby. 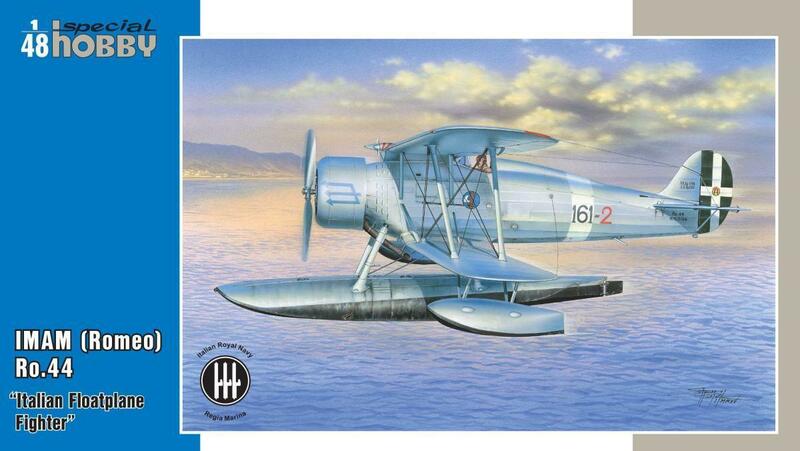 The IMAM Ro.43 was an Italian reconnaissance single float seaplane, serving in the Regia Marina between 1935 and 1943. Kit features engraved panel lines, restrained fabric-over-frame effects, well appointed cockpit and gunner station with machine gun, engine detail, two-piece cowling, one-piece three-blade propeller, injection-molded canopy and window glazings, extensive resin and photoetch parts, float undercarriage with beaching gear. 1/48 scale. 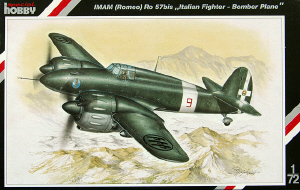 IMAM Romeo Ro.43 "War Colors." Special Hobby. 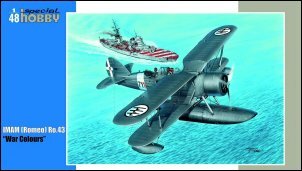 The IMAM Ro.43 was an Italian reconnaissance single float seaplane, serving in the Regia Marina between 1935 and 1943. Kit features engraved panel lines, restrained fabric-over-frame effects, well appointed cockpit and gunner station with machine gun, fuselage detail, detailed engine, two-piece cowling, one-piece three-blade propeller, two-piece canopy and window glazings, extensive resin and photoetch parts for interior and exterior, float undercarriage with beaching gear. 1/32 scale. Fiat G.50-II Freccia "Regia Aeronautica." Special Hobby. The Fiat G.50 Freccia (Arrow) was a World War II Italian fighter aircraft. 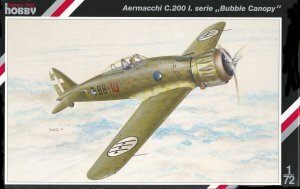 First flown in February 1937, the G.50 was Italy's first single-seat, all-metal monoplane with an enclosed cockpit and retractable undercarriage to go into production. Kit features engraved panel lines, well appointed cockpit with photo etch, one-piece canopy, acetate windscreens, resin parts (multi-part radial engine), two-piece cowling, three-blade propeller with optional spinner, cowling mounted machine guns, wheel wells. 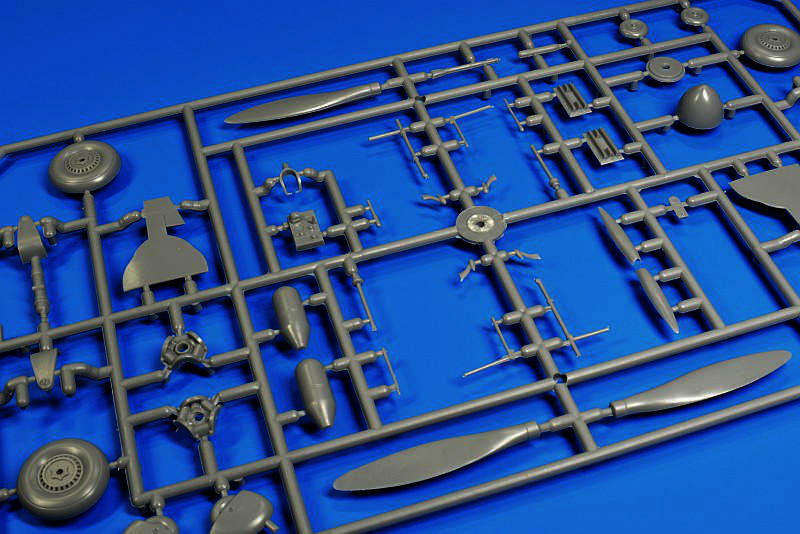 The model contains four sprues, clear injection canopy, detailed resin parts with superb Fiat A.74 engine and also a PE fret. The decal sheet offers markings for two Italian planes, both in typical Italian mottled camouflage scheme, but each one with a different camo scheme. 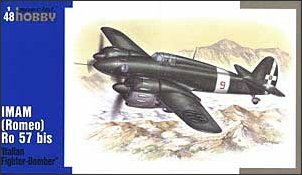 While the first machine flew from the territory of occupied Albania against the Greeks and British, the other machine was flown by the commander of the 20�Gruppo, maggiore pilota Mario Bonzano (17 victories). 1/32 scale. 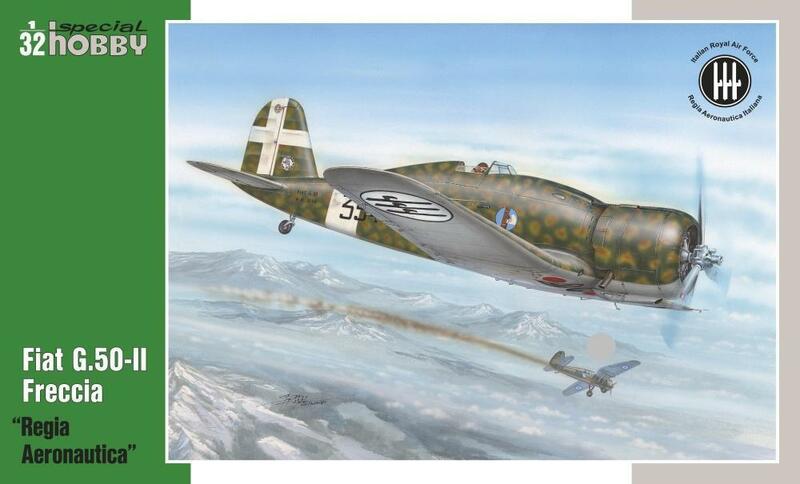 Fiat G.50bis Freccia "Luftwaffe and Croatian Air Force." Special Hobby. The Fiat G.50 Freccia (Arrow) was a World War II Italian fighter aircraft. First flown in February 1937, the G.50 was Italy's first single-seat, all-metal monoplane with an enclosed cockpit and retractable undercarriage to go into production. Kit features engraved panel lines, well appointed cockpit with photo etch, one-piece canopy, acetate windscreens, resin parts (multi-part radial engine), two-piece cowling, three-blade propeller with optional spinner, cowling mounted machine guns, wheel wells. 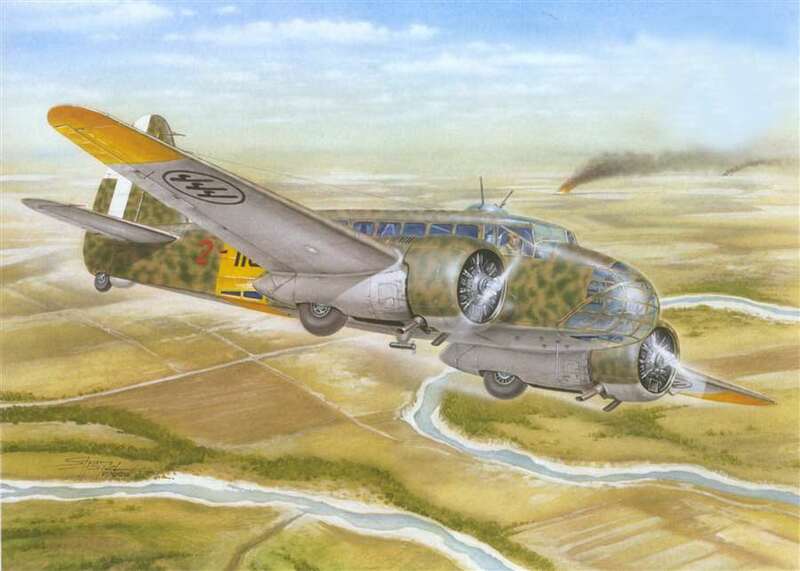 The Caproni Ca.311 was a light bomber-reconnaissance aircraft produced in Italy prior to and during World War II. It was a member of the large family of Caproni designs derived from the Ca.306 airliner prototype of 1935, and more directly a modification of the Ca.310 bomber. 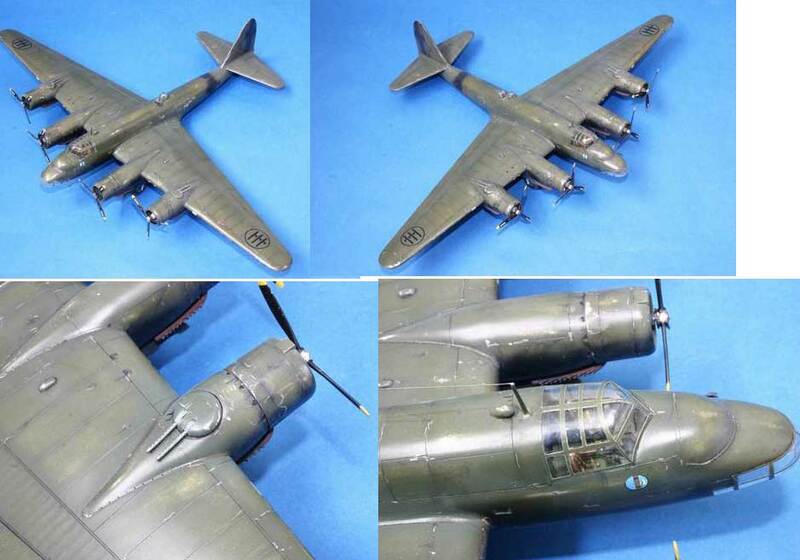 Kit has fine engraved panel lines, well appointed cockpit and forward fuselage interior, injection-molded clear (body, canopy and glazing's), fully rendered undercarriage, single-piece two-blade propellers, resin parts (single-piece radial engines, exhaust manifolds, wheels, machine guns, exterior accents) and photoetch parts (cockpit accents, landing gear details, exterior fittings), film instrument panel and precut mask. 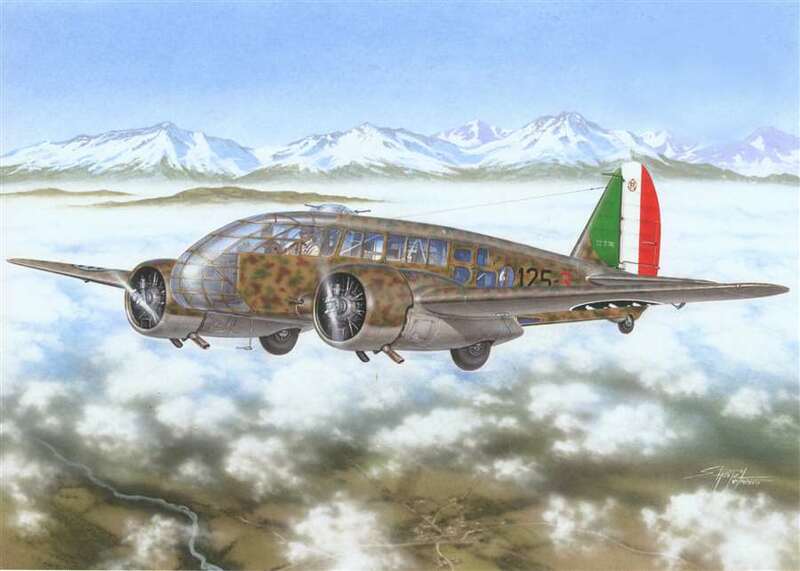 The Caproni Ca.311 was a light bomber-reconnaissance aircraft produced in Italy prior to and during World War II. Ca.311M 'Modified' version with less glazing. Kit has fine engraved panel lines, well appointed cockpit and forward fuselage interior, injection-molded (body, canopy and glazings), fully rendered undercarriage, single-piece 2-blade propellers, resin parts (single-piece radial engines, exhaust manifolds, wheels, machine guns, exterior accents) and photo-etch parts (cockpit accents, landing gear details, exterior fittings), film instrument panel and precut mask. 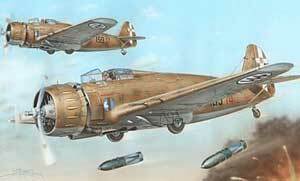 The Caproni Ca.311 was a light bomber-reconnaissance aircraft produced in Italy prior to and during World War II. Ca.311 twin-engined reconnaissance bomber aircraft. 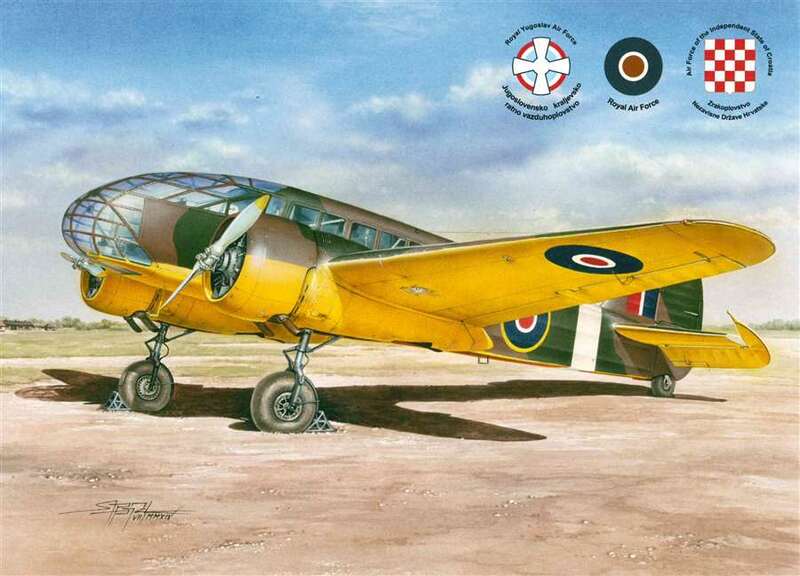 Kit has fine engraved panel lines, well appointed cockpit and forward fuselage interior, injection-molded (body, canopy and glazings), fully rendered undercarriage, single-piece 2-blade propellers, resin parts (single-piece radial engines, exhaust manifolds, wheels, machine guns, exterior accents) and photoetch parts (cockpit accents, landing gear details, exterior fittings), film instrument panel and precut mask. 1930s-40s Italian monoplane attack aircraft, 2-seat variant with dorsal gunner. 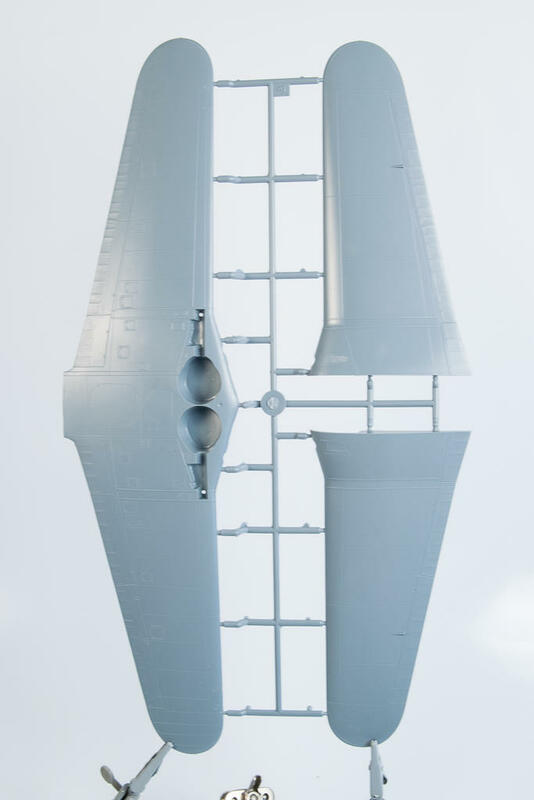 Limited-run airframe with fine engraved panel lines, highly detailed cockpit with separate framing, fuel cells, your choice of dorsal turret or faired gunner's station plus injection-molded clear parts (including segmented canopy). Also features photo-etch parts (interior and exterior detail) and resin parts (cowling, excellent multi-part radial engine, propeller hub/blades, and intake/exhaust elements). 4. For�a A�rea Portuguesa Ba.65A.80 No 555 of the Groupo de Bombardeo de Dia at Sintra AB, 1938-1941. 1930s-40s Italian monoplane ground-attack aircraft. Limited-run airframe with fine engraved panel lines, highly detailed cockpit with separate framing, bomb bay, and injection-molded clear parts including 3-piece canopy. Also features photo-etch parts (interior and exterior detail) and resin parts (cowling, multi-part radial engine, bombs, propeller hub/blades, and intake/exhaust elements). 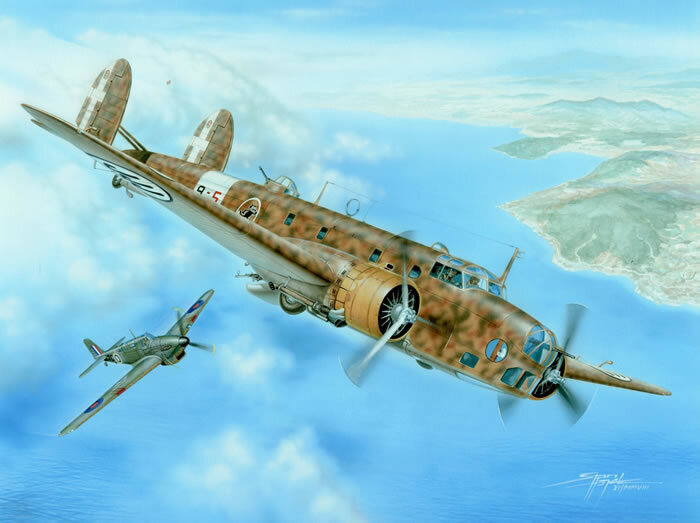 Introduced in 1936 this Italian twin-engine bomber was one of the most advanced of its kind. The BR.20 was first used in both the Spanish Civil War and the Sino-Japanese war where its speed rendered it virtually immune to the fighters of the time. The Br.20 was also employed over England where it bombed the cities of Ramsgate, Harwich, Great Yarmouth and Ipswich sustaining only five losses throughout the campaign. The bomber was also successfully deployed over the Balkans, the Soviet Union and North Africa. 1. 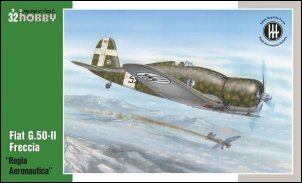 Regia Aeronautica: 9-5 of 9� Squadriglia, 25� Gruppo, 7� Stormo; Cameri, Feb. 1941. 3. 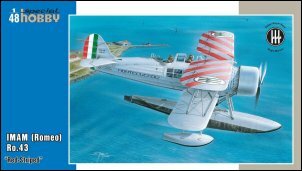 Regia Aeronautica: 5-6 of 5� Squadriglia, 43� Gruppo, 13� Stormo, Lonate, 1936. 4. 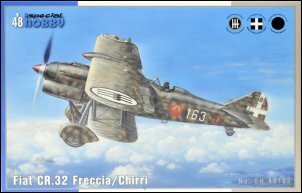 Regia Aeronautica: 47-3 of 47� Squadriglia, 37� Gruppo, 18� Stormo, Aviano, 1939. This aeroplane was designed in 1939 and remained in the prototype stage for a long time, despite the aeroplanes good performance in test flights. In 1942, under the pressure of war a few aircraft had been constructed. 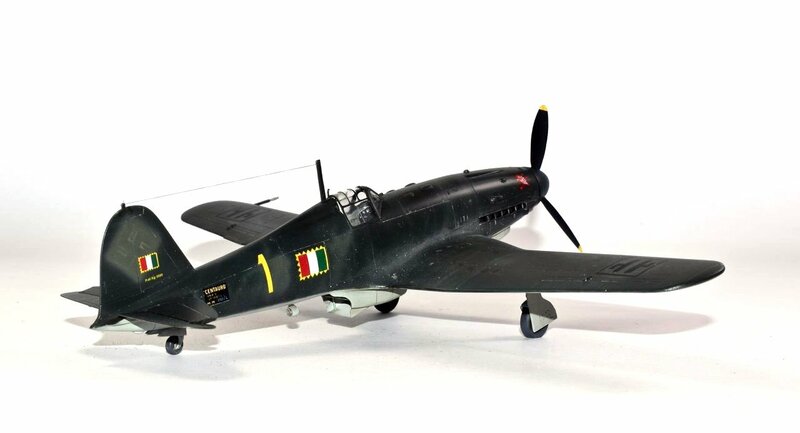 About 60 were constructed and put into service with the the Regia Aeronautica as a twin-engine, single-seat, heavy fighter, dive bombers. 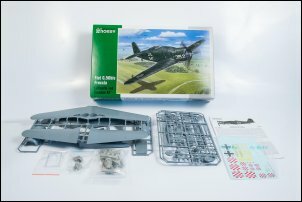 Kit features engraved panel lines, detailed cockpit, resin parts (highly detailed radial engines, cowlings, cockpit and exterior details) and photo-etch parts (including instrument panel, seatbelts, seat armor, bomb fins, and dive brakes). 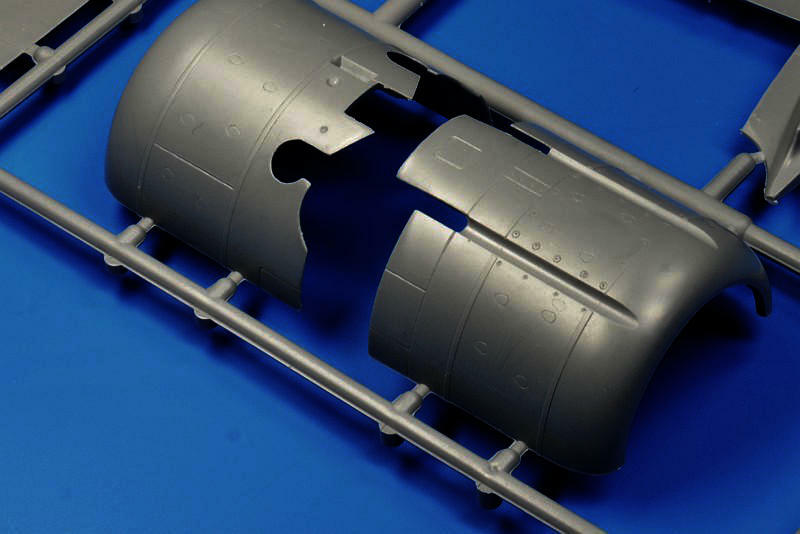 Also includes external stores (underwing and centerline bombs), injection-molded clear parts and film instruments. 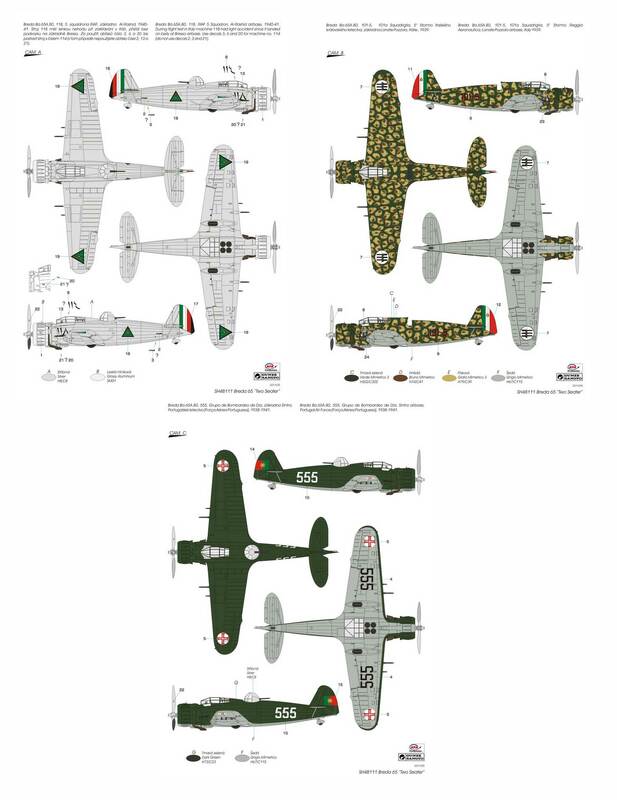 Decals and color painting reference for nine (3) Regia Aeronautica aircraft: 'Red 9', 97 Gruppo Autonomo, July 1943; 'Red 5', 97 Gruppo Autonomo, July 1943; and MM75326, Naples-Capodichino airfield, 1943. 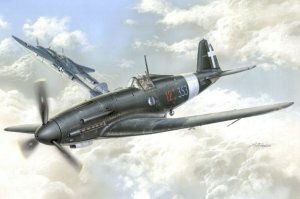 The Fiat G.50 is a Classic WWII Fighter. 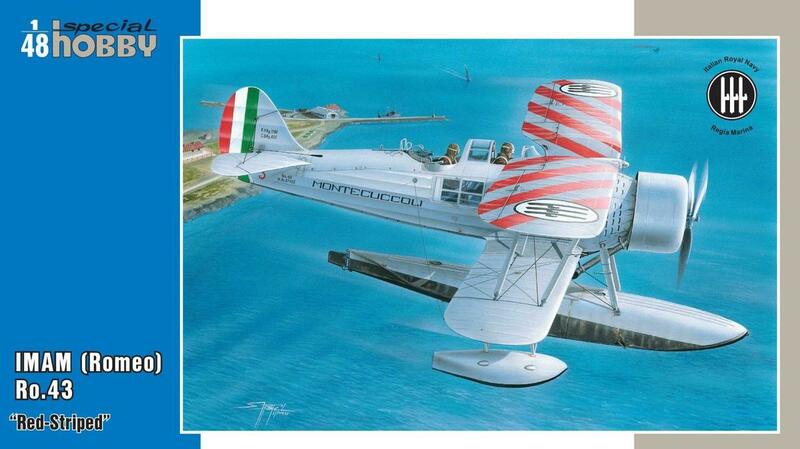 The plane was first designed in 1937 and entered service with the Regia Aeronautica in 1939 over the skies of Spain. 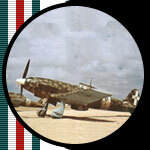 It was the first all metal monoplane fighter to enter service with the Regia Aeronautica. Although not as quick or maneuverable as the Mc.200, its performance was nonetheless comparable to that of the Hawker Hurricane. In service with the Finnish Air Force the Fiat G.50 achieved legendary status, many Finnish aces used the type at one time or another and Oiva 'Oippa' Tuominen scored the majority of his 44 kills with the G.50. 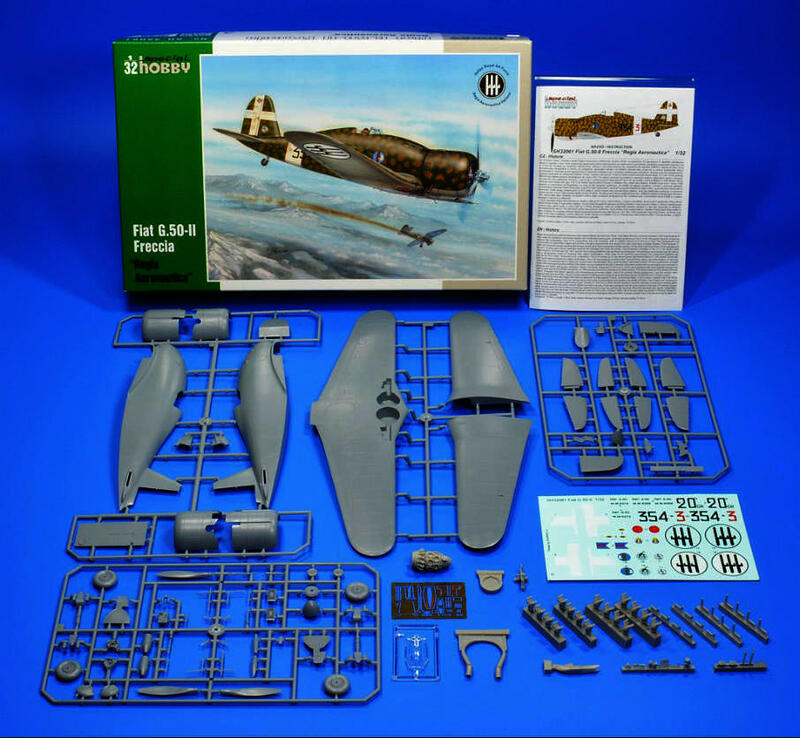 This kit is a limited-run airframe with finely engraved panel lines, detailed cockpit, optional rudder/vertical stabilizers, optional ski or wheeled undercarriage, optional spinners, and injection-molded windscreen. 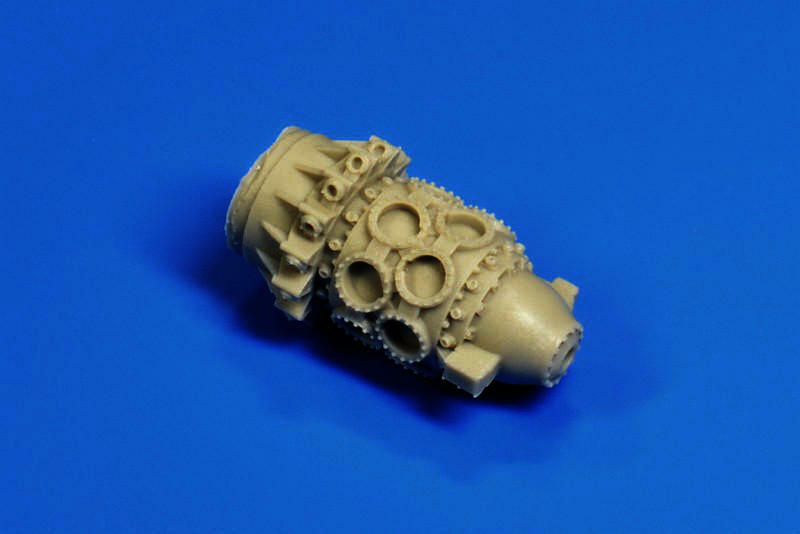 Also includes resin parts (multi-part radial engine, cowling and additional details) photo-etch parts (ignition harness, instrument panel, seatbelts and other fine bits) plus film instruments. NOTE: this kit also comes with fully glazed canopy to build early Fiat G.50 Serie I and II aircraft. 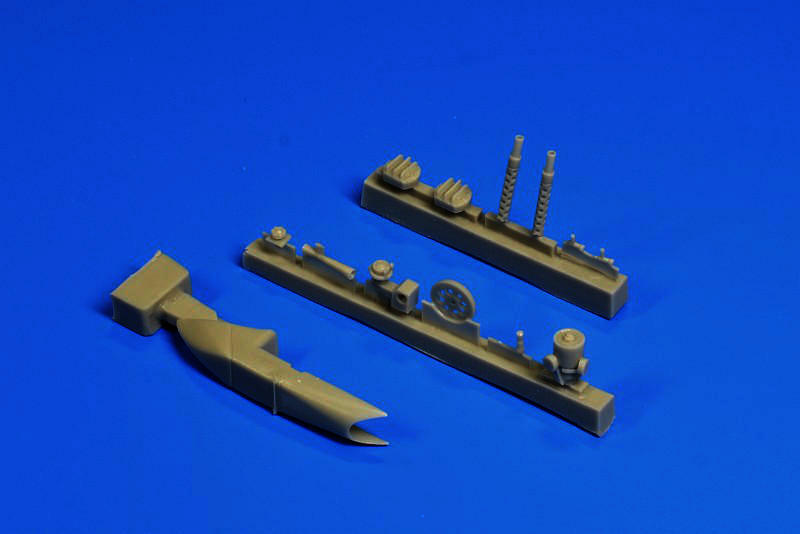 Can build any Fiat G.50 with this kit. One of the best kits on offer by Special Hobby. Decals and color painting reference for nine (9) Ilmavoimat schemes: FA-25, 2/LeLv 26 (x2); FA-1, 2/LLv 26 (x4); FA-33, LLv 26 (x3). The G.55's increasing popularity amongst modelers and aviation enthusiast alike is a direct result of its increased coverage and exposure by modelers and aviation historians. Often forgotten in the past, the G.55 was a first-rate singe seat fighter with performance comparable to the best Allied fighters of the time. In combat over Europe, the G.55 maintained its own against overwhelming odds. 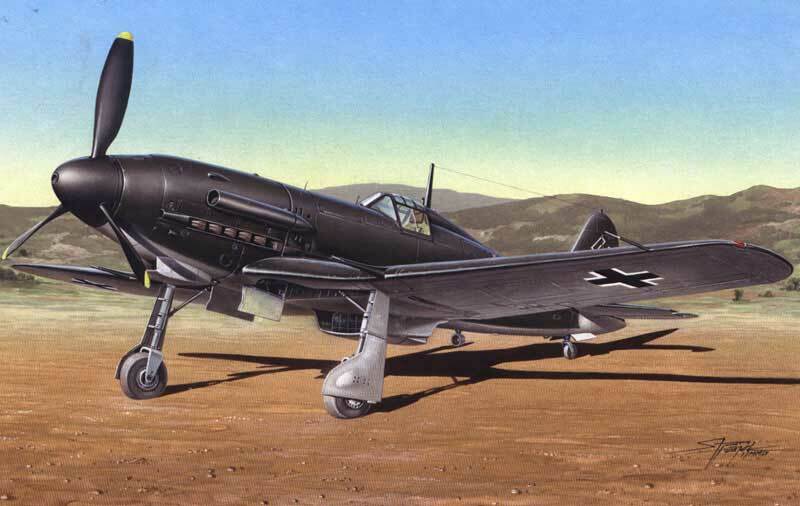 Series production was also considered by the Germans who soon discovered the G.55 was the only Axis fighter available that could accept the new powerful DB.603 (1,800 hp) engine (a design limitation of the Bf.109). 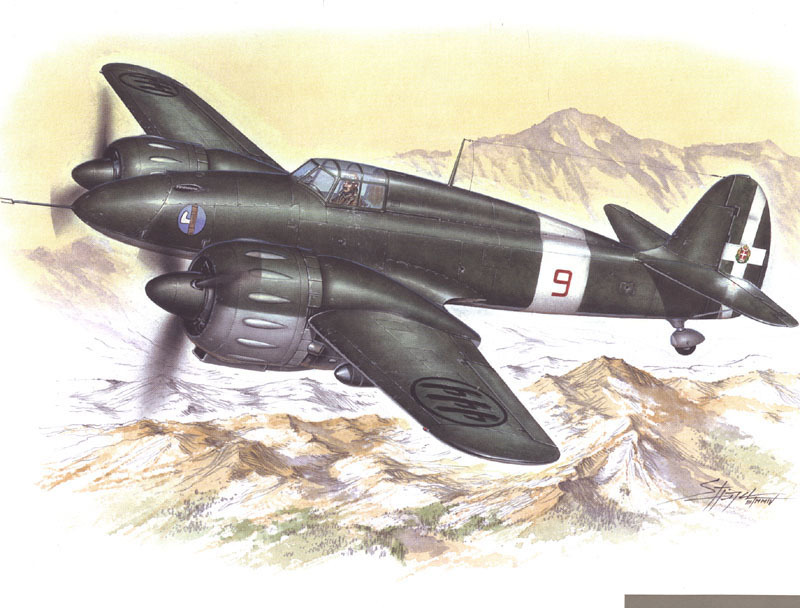 However, like so many excellent Italian WWII war programs the G.55 was built in too few numbers. 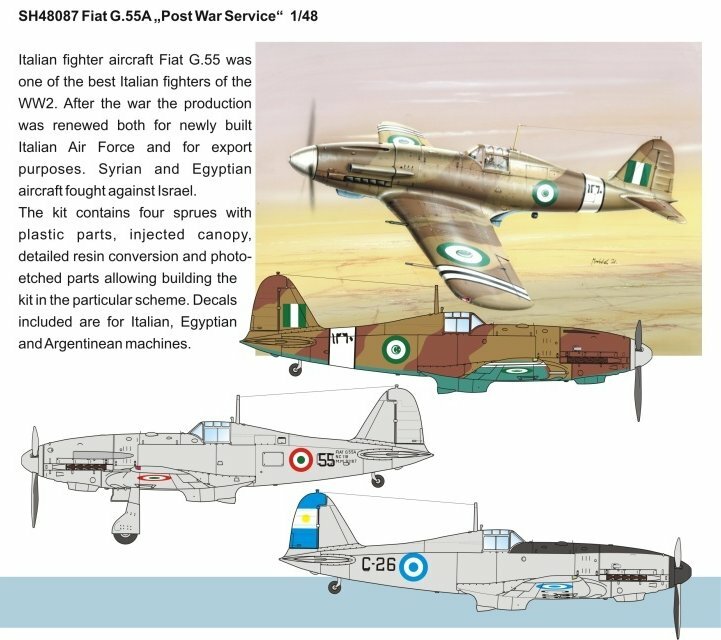 The Fiat G.55 established itself as a premier fighter and was built in several variants and continued to be built after the war with purchase orders from Argentina, Syria and Egypt. 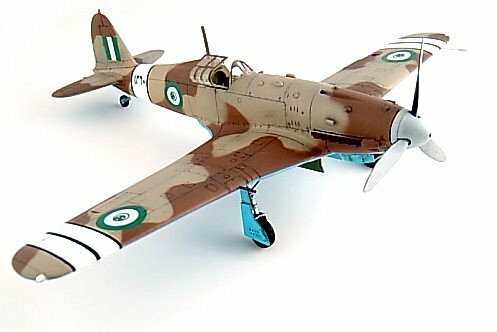 This is the post-war version of this excellent kit, referred to as the Fiat G.55A. The Fiat G.55A was armed with 4 x 12 mm machine guns. The Argentinean�s purchased 10 overhauled G.55s and 35 new aircraft plus 15 two-seaters and were equipped with VHF radios. The planes continued service until the mid-1950s. The Syrians purchased 12 single-seaters and 1 two seater. Increasing tensions with Israel, the Egyptians purchased 39 new planes and two two-seaters. Kit has recessed panel lines, highly detailed cockpit, resin parts (gunsight, wing gun barrels, and optional upper cowling without gun troughs), photo-etch parts (instrument panel, seatbelts, radiator faces, cockpit enhancements and additional details), film instruments, and injection-molded canopy. 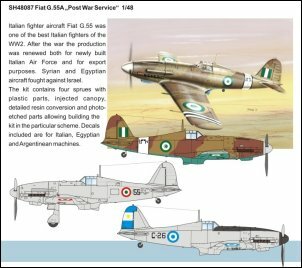 Decals and painting guide for 3 aircraft: 5th Squadron, Royal Egyptian Air Force, December 1948; MM91167/55, Scuola Caccia, Aeronautica Militare Italiana, 1947 and C-26, Regimiento No 2 de Casa, Fuerza A�rea Argentina, 1949. The G.55 was the equivalent of the Mustang, Spitfire and Focke-Wulf 190. Fast, heavily armed and highly maneuverable, the plane was effective against Allied bombers. 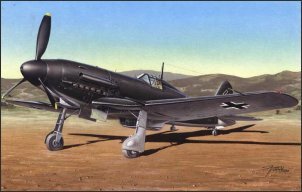 Series production was also considered by the Germans who soon discovered that the G.55 was the only Axis fighter available that could accept the new powerful DB.603 (1,800 hp) engine (a design limitation of the Bf.109). 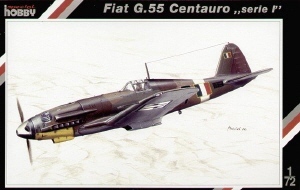 However, like so many excellent Italian war programs the G.55 was built in too few numbers. 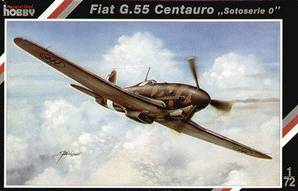 The Fiat G.55 established itself as a premier fighter and was built in several variants and continued to be built after the war with purchase orders from Argentina, Syria and Egypt. 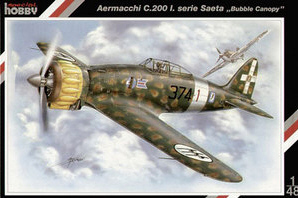 The Sotttoserie 0 (pre-series) aircraft were armed with one 20mmm cannon and four 0.5 calibre machine guns. About 30 examples of these powerful preseries aircraft were manufactured and delivered to the Regia Aeronautica and the Aeronautica Nazionale Republicana. These planes took part in the air battles to defend Rome. 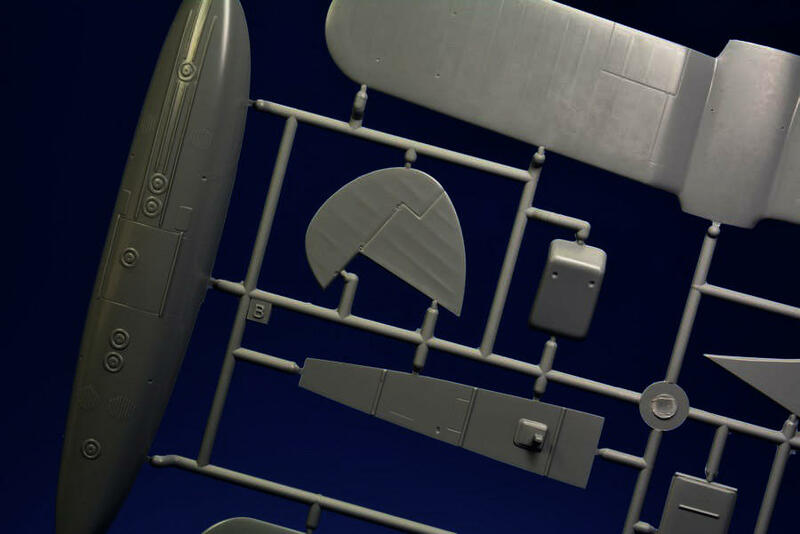 Comes with 85 medium grey injection molded parts on four frames, includes injection molded clear parts on one frame, resin and photo etch parts and decals for three aircraft plus four pages with parts plan, history, build instructions and painting/decal diagrams. This advanced four engined strategic bomber was the only one of its type placed into production by the Axis powers in WWII. Produced in sufficient numbers, this bomber could have tilted the balance of air power in the Mediterranean. Heavily armed and with a good operational range, the P.108 would strike deep into the Mediterranean hitting Girbraltar and Algeria. 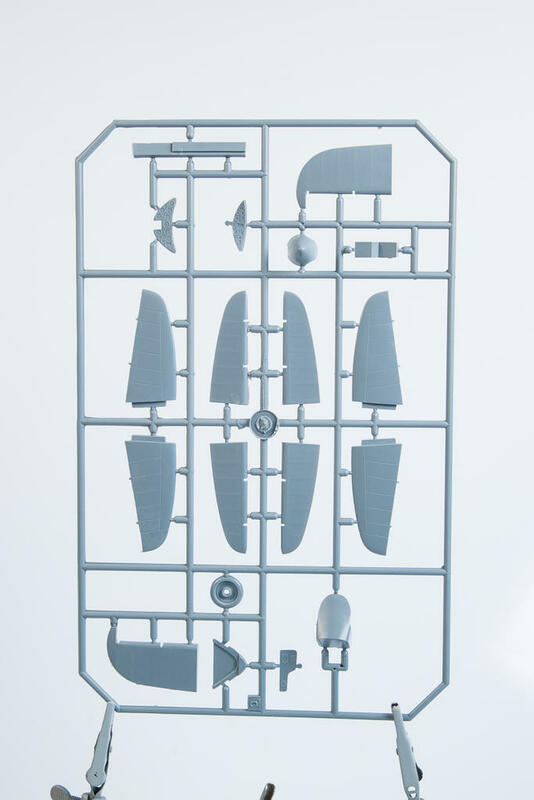 This kit, P.108B Serie II (Flying Machines P.108B Serie I) , comes with 85 medium grey injection moulded parts on four frames, 13 injection moulded clear parts on one frame, 33 resin parts and decals for two aircraft plus four pages with parts plan, history, build instructions and painting/decal diagrams. 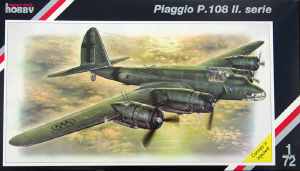 Designed and built in 1939, the Piaggio P.108 was one of the most advanced heavy bombers of WWII featuring remote controlled gun turrets, a heavy bomb load, and a good operational range striking deep into the Mediterranean; only too few aircraft were constructed due to a chronic shortage of raw materials. 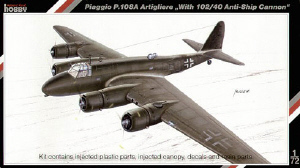 The P.108A was a variant of the original strategic bomber and was equipped with a 102mm canon for anti-shipping work. The gun was capable of firing 20 rounds per minute and was feed by an automatic loader. This kit comes with finely engraved recessed panel lines and beautifully furnished PE sets and resin parts. Decals for one Luftwaffe P.108A. 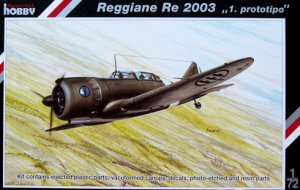 Although used in relatively small numbers by the Regia Aeronautica the Re.2000 was quite likely the best of the R-Programme fighters outflying the Bf.109E and securing an order from Great Britian for 300 planes in 1939. This kit comes with finely engraved recessed panel lines and beautifully furnished PE sets and resin parts. Comes with a detailed cockpit interior. 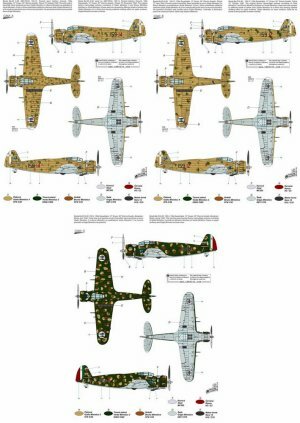 Decals for Regia Aeronautica Fighters. This aeroplane was designed in 1939 and remained in the prototype stage for a long time, despite the aeroplanes good performance in test flights. In 1942, under the pressure of war a few aircraft had been constructed. About 60 were constructed and put into service with the the Regia Aeronautica as fighter-bommbers and dive bombers. 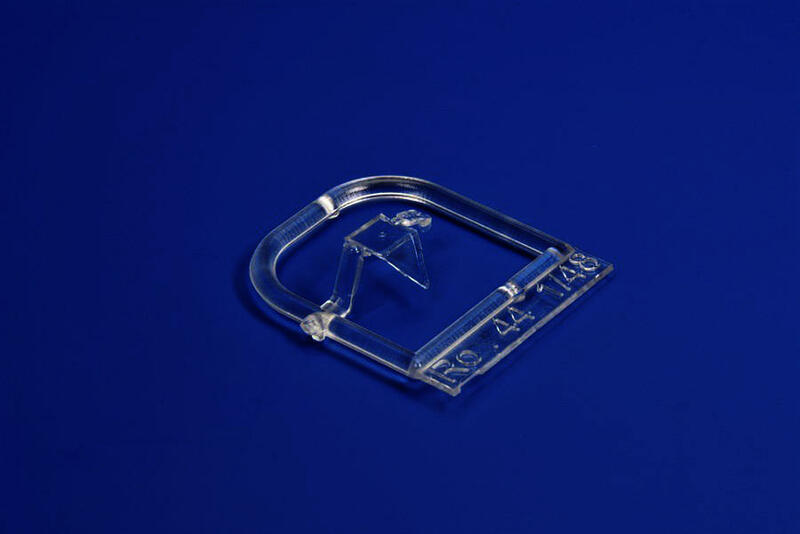 This kit comes with finely engraved recessed panel lines and beautifully cast resin parts. Comes with a detailed cockpit interior. 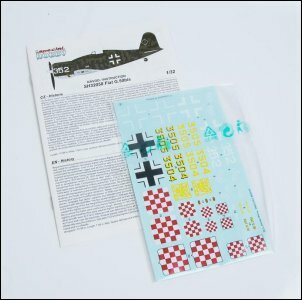 Decals for two Regia Aeronautica Fighters. Designed in 1939 as a long range fighter and despite the aeroplanes good performance in test flights, the plane was only ordered into production in 1942 under the pressure of war. About 60 were constructed and put into service with the Regia Aeronautica as fighter-bommbers and gave a reasonably good account of itself. 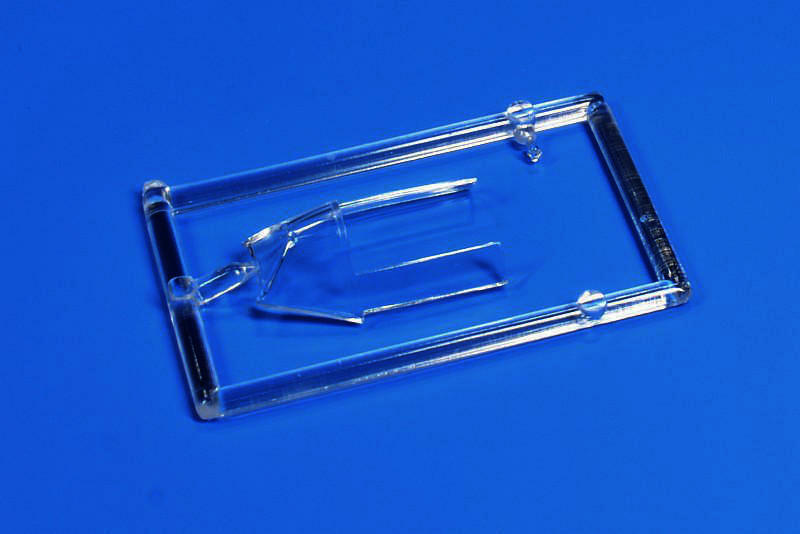 This injection moulded plastic kit includes clear plastic parts, nicely moulded resin parts, 12 PE parts on a single fret and 1 clear film instrument face for the PE instrument panel. 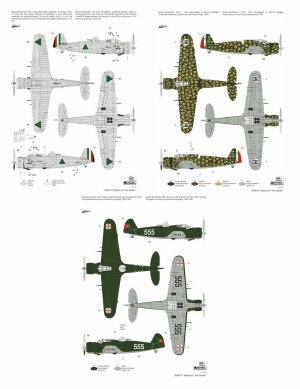 Crisply printed decals for two aircraft (1943 Rome - Ciampino ) and an 8 page instruction booklet containing history, parts plan, build diagrams and paint/decal drawings. Designed as a modern heavy long range fighter, two prototypes were followed by ten pre-production machines. 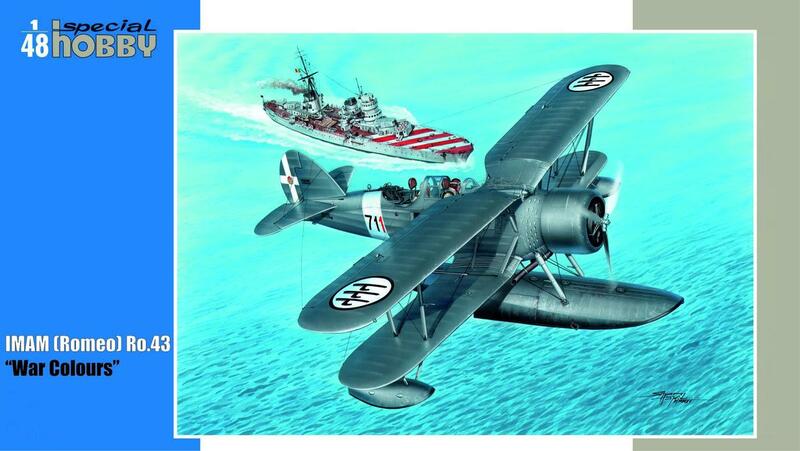 These planes performed effective combat service for the Mediterranean Convoys. 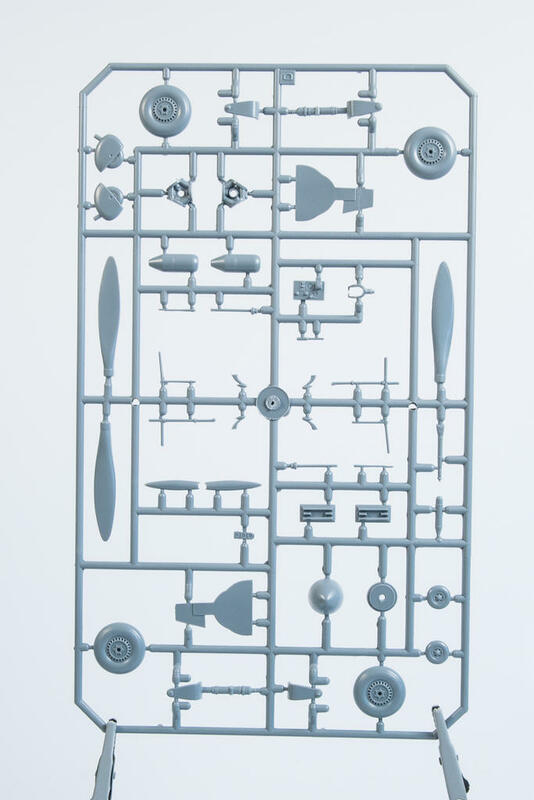 This kit comes with recessed panel lines and is furnished with PE sets and resin parts. 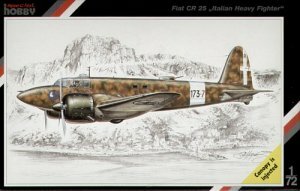 Designed as a heavy long range fighter, two prototypes were followed by ten pre-production machines one of which was used as a VIP transport by the Italian Air Attach� in Berlin and designated CR.25D. This kit comes with finely engraved recessed panel lines and beautifully furnished PE sets and resin parts. Comes with a detailed cockpit interior. 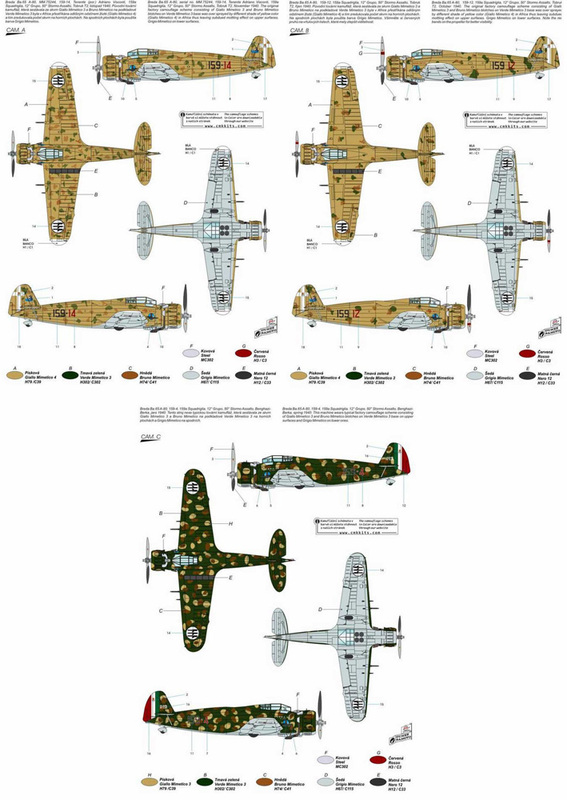 Decals for three Regia Aeronautica Fighters. 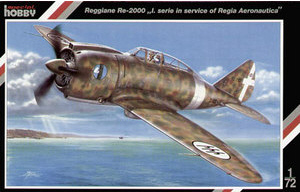 Although used in relatively small numbers by the Regia Aeronautica the Re.2000 was quite likely the best of the R-Programme fighters and even out flying the Bf.109E. The Re.2000 was exported in fairly large numbers to Sweden and Hungary. 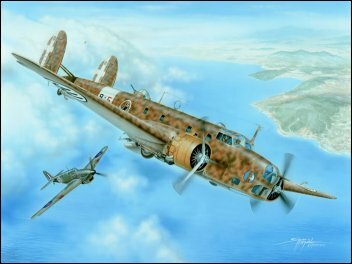 Yugoslavia, Spain, Switzerland and Finland all began negotiations to acquire the plane but these orders were automatically canceled when Italy went to war. 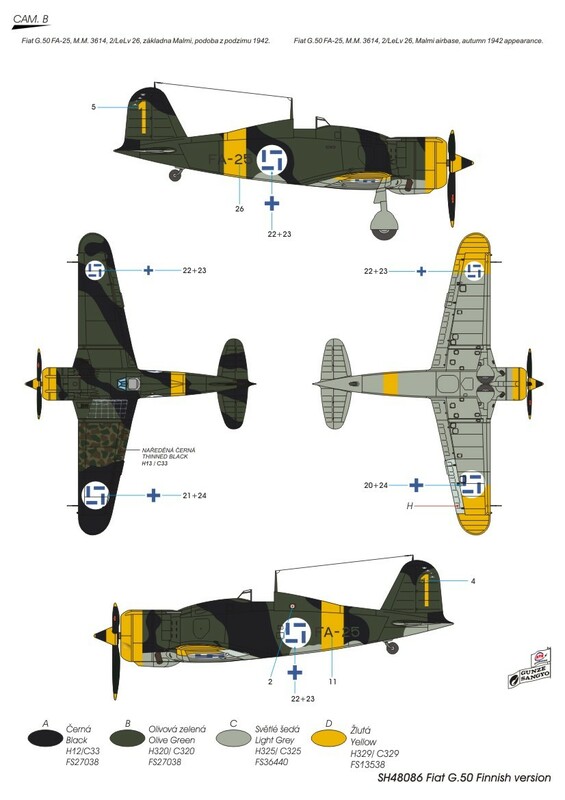 Hungary also built a number of Re.2000s under license in which the Piaggio radial engine was substituted with the Manfred Weiss WM K-14 (Gnome-Rh�ne 14K Mistral Major radial) and hence the change in name to Mavag Heja. 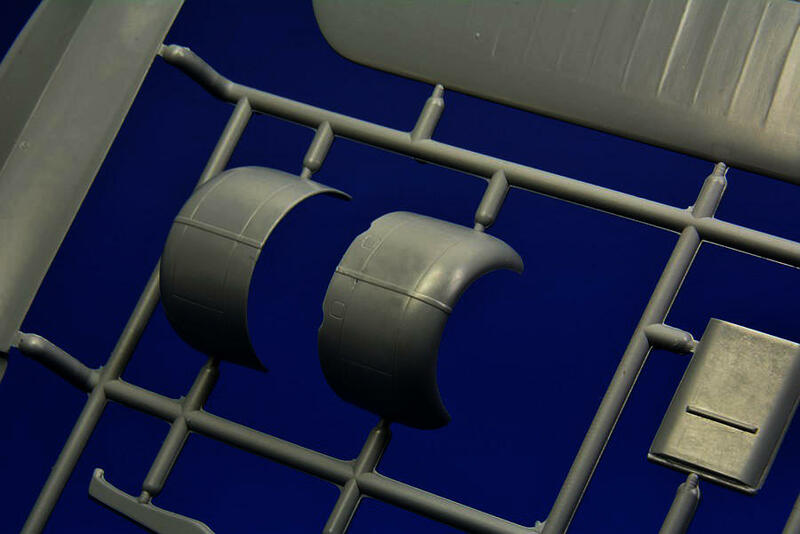 This kit comes with finely engraved recessed panel lines and PE sets and resin parts. 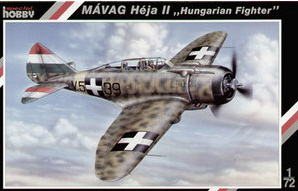 Comes with a detailed cockpit interior and decals for Hungarian Fighters. 'DB 603 Engine'. WWII Italian single-seat fighter prototype aircraft combining the existing G.55 airframe with German Daimler-Benz DB 603 engine (the only single-seat fighter in the axis inventory capable of accepting the engine in 1943). Production plans to produce the G.56 in Germany. Kit has recessed panel lines, extensive resin parts (cockpit sidewalls, floorboard with seat, replacement nose section, exhaust stacks, wheel wells, spinner, propeller blades, radiator plugs, tail wheel and many additional details), photo-etch parts (seatbelts, rudder pedals, radiator faces, instrument panels, trim tab actuators and canopy handholds), film instruments and 2 vacuform canopies. 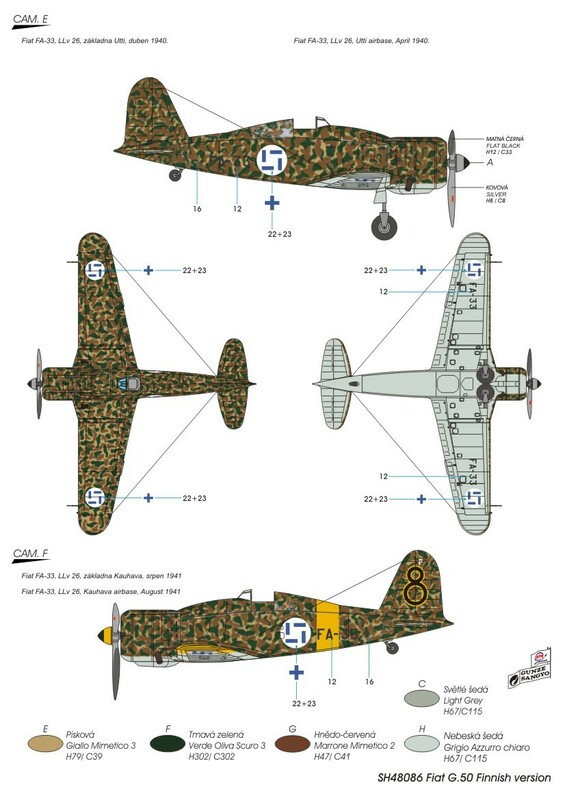 Decals and painting notes for a single aircraft: M.M.536 in German Luftwaffe insignia. 'DB 603 Engine'. WWII Italian single-seat fighter prototype aircraft combining the existing G.55 airframe with German Daimler-Benz DB 603 engine (the only single-seat fighter in the axis inventory capable of accepting the engine in 1943. 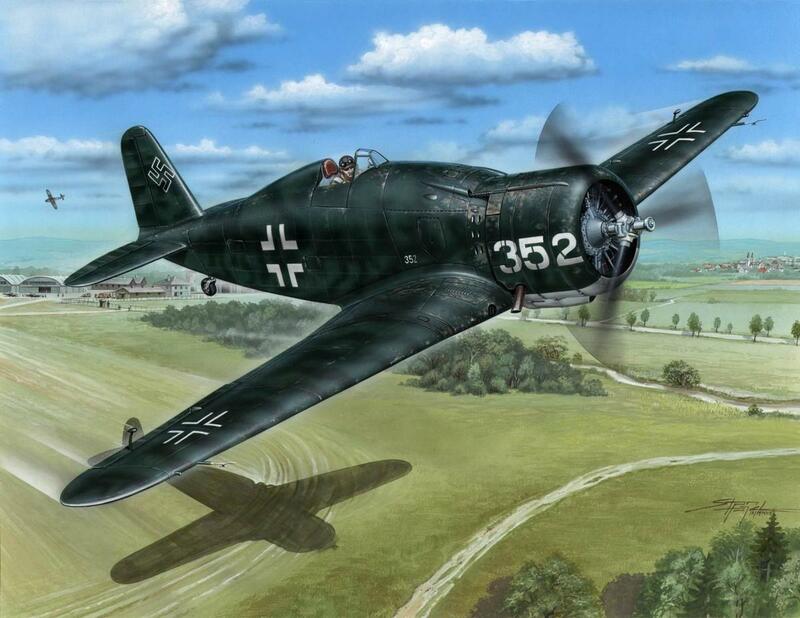 Production plans to produce the G.56 in Germany. Kit features recessed panel lines, resin parts (cockpit seat, floor, rudder pedals, rear bulkhead, side walls, exhausts, wheel wells, tailwheel and more), photo-etch parts (instrument panel, seatbelts, radiator faces and additional details), film instruments and injection-molded canopy. M.M.? ?, first machine handed over to Luftwaffe, October 1943. 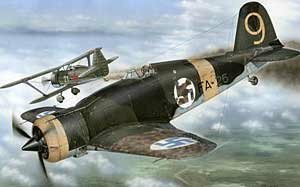 The Fiat G.55 was one of the best Italian fighters of WWII and was heavily armed. 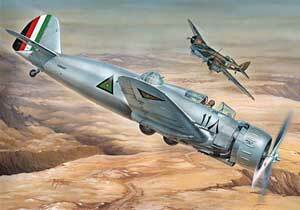 The Sotttoseries 0 (sub-series) aircraft were armed with one 20mmm cannon and four 0.5 calibre machine guns. About 30 examples of these preseries aircraft were manufactured and delivered to the Regia Aeronautica and the Aeronautica Nazionale Republicana. 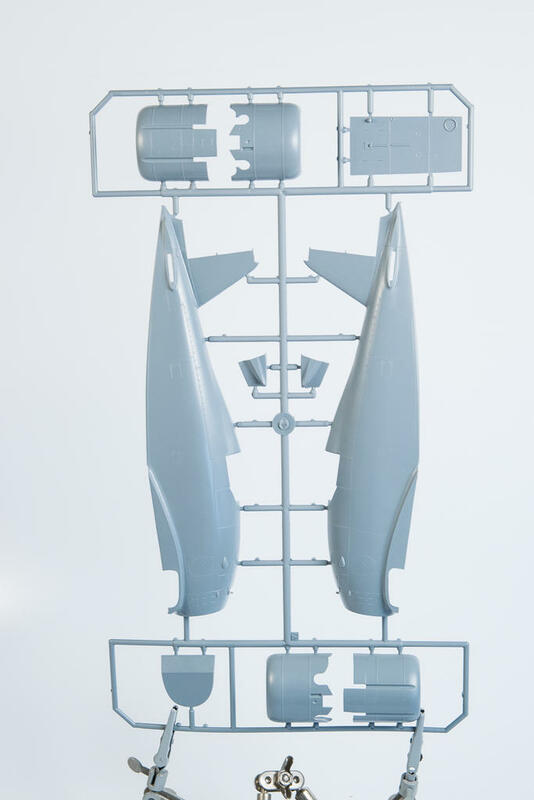 This kit is laid out in two frames and is complemented by resin parts, including a new nose and fin unit for the G 55 Sottoserie 0 as well as photo-etched parts. Decals offer a choice of three machines. The first option is the MM492 prototype in the "lizard" camouflage. The second machine, in two variants of markings flew with grigio azzuro chiaro upper and lower surfaces. 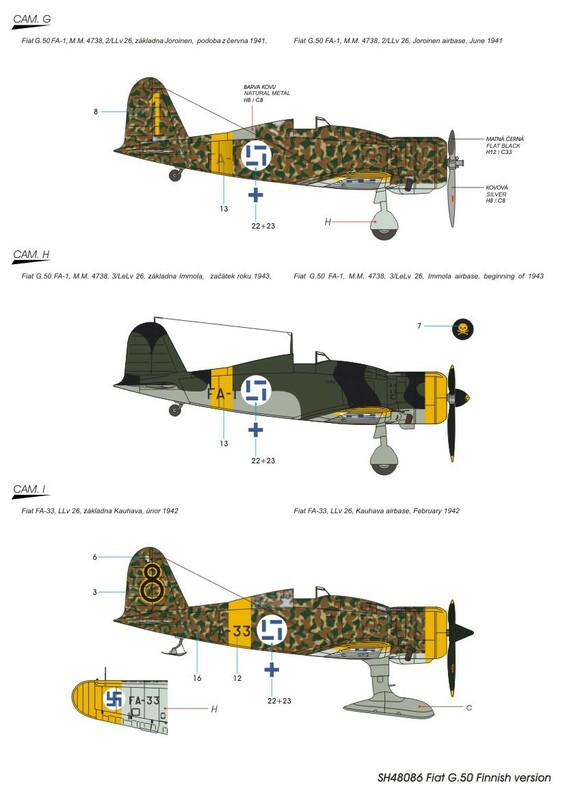 The third option is in a Luftwaffe camouflage with ANR markings. One of the best fighters of WWII, the Fiat G.55 was heavily armed with three 20mm cannons and two 0.5 calibre machine guns. 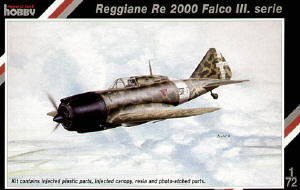 The plane was used by the Regia Aeronautica and the Aeronautica Nazionale Republicana and continued in production after WWII serving with the Egyptian and Argentinian Air Forces. 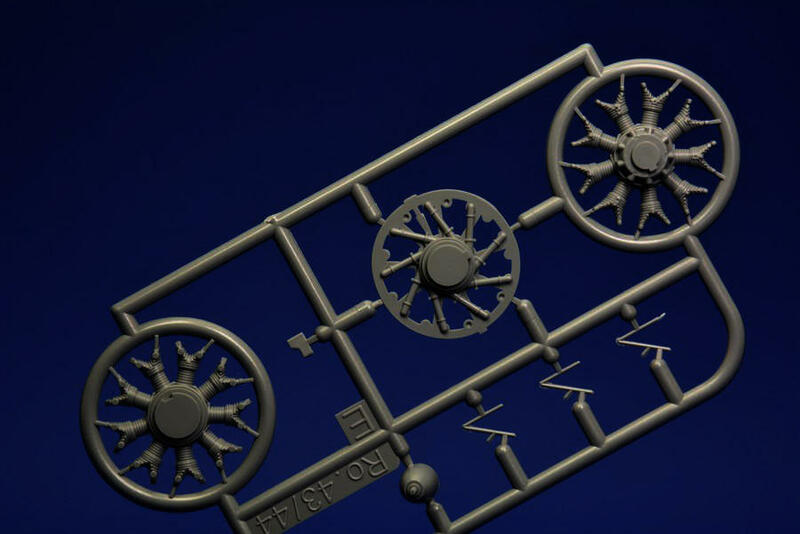 Kit includes 29 parts in medium grey injection moulded plastic and 19 resin parts. 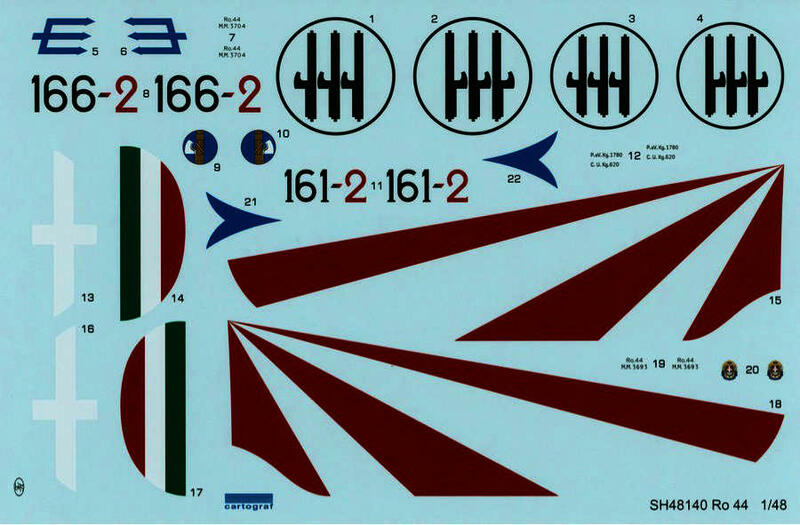 Decals for three aircraft. Undoubtedly the best fighter available in large quantity to the Regia Aeronautica at beginning of the war, the Macchi C.200 was a robust, extremely maneuverable and a reasonably fast monoplane. Designed by ing. Mario Castoldi, the winner of various Schneider Trophy contests, the C.200 was liked by its pilots and many Regia Aeronautica pilots would earn ace status flying this plane. The MC.200 would eventually be developed into the potent MC.202. Flown for the first time in February 1935 by Arturo Ferrarin, the FN.305 was a two seat light training monoplane and was an outstanding aircraft on all counts, establishing many speed and distance records. 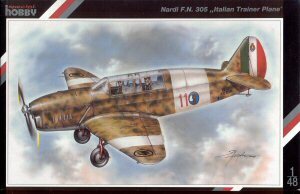 The Nardi FN.305 also secured many foreign orders and was produced in large quantity for the Regia Aeronautica. Includes a detailed exterior w/ engraved panel lines. Resin & photo-etch detail parts. Vacuform canopies. Mkgs for three Regia Aeronautica machines. Flown for the first time in February 1935 by Arturo Ferrarin, the FN.305 was a two seat light training monoplane and was an outstanding aircraft on all counts, establishing many speed and distance records. 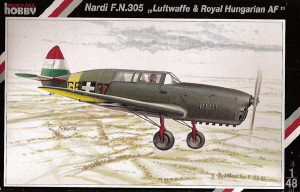 The Nardi FN.305 also secured many foreign orders and was used extensively by the Luftwaffe and the Royal Hungarian Airforce. Includes a detailed exterior w/ engraved panel lines. Resin & photo-etch detail parts. Vacuform canopies. Mkgs for 2 aircraft, Luftwaffe and the Royal Hungarian Airforce. The French built SPAD VII was a single seat biplane fighter used widely in WWI by the French and Italian Air Forces. 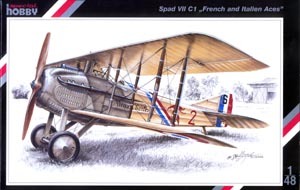 The SPAD VII was flown by many French and Italian Aces. Includes a detailed exterior w/ engraved panel lines. Vacuform canopies. 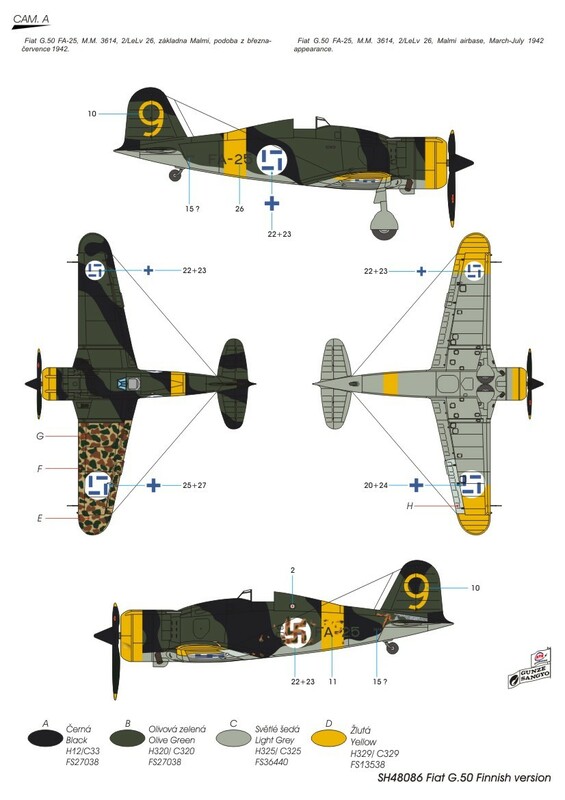 Markings for 3 Aces aircraft; 2 French including Guynemer's "Vieux Charles", Maxime Lenoir's (Lehn wahr) "Trompe La Morte" (Daredevil) and Fulco Ruffo di Calabria's plane in Italian markings, skull and crossbones painted over the fuselage insignia roundel. The Re.2003 was an experimental tandem two-seat reconnaissance bomber developed from the Re.2000 Serie III using the same 1025 hp P.XIbis RC40 radial engine. In addition to the second cockpit with its angular canopy, further windows were provided on the side of the fuselage. Two prototypes were constructed the first with the regular Re.2000 type engine cowling and spinner, the second with the cowling and spinner of the Re. 2002 Ariete. Armament consisted of two 12.7 mm machine guns and a bomb load of 1100 lb. The Re. 2003 could reach a top speed of 293 mph. Includes interior resin fuselage halves, interior detail, PE parts, vacuform canopy and decals for the trialed first prototype. 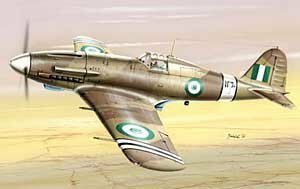 Thoroughly underrated, the Macchi C.200 was the contemporary of the Hawker Hurricane, however the C.200 was able to out climb, out dive and out maneuver it. Both planes had similar straight-line speeds except the C.200 would not bleed speed during tight turns, climbing or diving. 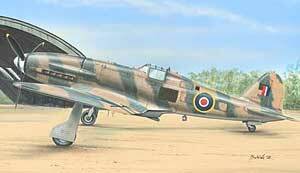 In air battles over Malta and Greece, the C.200 was only matched by the early Spitfires. Includes interior resin cockpit, engine and cowling. Vacuform canopy and decals for three planes.